Oscar is Chair of the PIDG Ltd. Credit Committee. He has over 19 years’ banking experience in Africa and has worked in London, Johannesburg, Gaborone, and Nairobi for Barclays and Standard Bank. 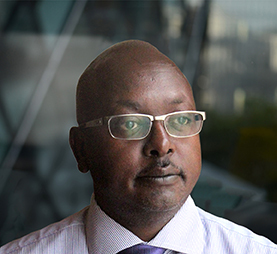 Oscar’s banking career has seen him involved in projects across 18 sub-Saharan Africa markets. During his banking career, he was the Head of Credit for Corporate and Investment Banking in Africa for Standard Bank, Head of Corporate Credit Africa for Barclays and the Head of Client Coverage for East Africa for Standard Bank, among other roles. From 2005 to 2013, Oscar represented Barclays and subsequently Standard Bank on the Credit Committee of the Emerging Africa Infrastructure Fund. Oscar holds a Bachelor of Commerce degree from the University of Nairobi and is a member of the Institute of Certified Public Accountants of Kenya.